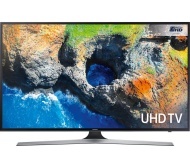 alaTest has collected and analyzed 491 reviews of Samsung UE55MU6100 Series. The average rating for this product is 4.6/5, compared to an average rating of 4.3/5 for other products in the same category for all reviews. We analyzed user and expert ratings, product age and more factors. Compared to other products in the same category the Samsung UE55MU6100 Series is awarded an overall alaScore™ of 89/100 = Very good quality. As the most popular TV brand in the world, every Samsung TV comes with a certain expectation. More still, the UE55MU6100 comes from its highly popular 6 Series. So will it crumble under the pressure? Find out in our expert TV review. "Fantastic picture easy to set up well worth the money"
"This was my first purchase and I must say I was very pleased with the product, delivery and service. I would definitely recommend. 5 stars and will be back in future for more items." "great tv for the price my first 4k tv picture is goog quality "
"I love this tv easy to set up and only took me about 20mins the picture is great and sound for a tv isn't to bad either, all round great tv would highly recommend."